Review date: 4 May 2000. Microsoft's IntelliEye line of optical mouses are quite popular, and for good reason. They're the first no-ball mouses that don't need a special mousemat. Most mouses are "opto-mechanical". They use a rubber-coated ball that turns two little rollers, which are on axles that end with a slotted disc, which interrupts a couple of little beams of light, which in turn allows the mouse's electronics to figure out which way the ball's turning, and how fast. It's a cheap system that works really well. Until it gets dirty. 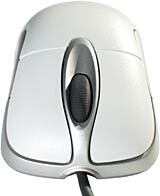 Optical mouses, in contrast, use sensors that look directly at what's under the mouse. But they all, until recently, needed a special spotty or gridded mouse pad in order to work. Some of 'em could be used, in a pinch, on a newspaper photo. The ones that didn't need a reflective metal mat would work OK on a photocopy of their mat. But, generally speaking, if you lost or destroyed the special mouse mat, your optical mouse became a paperweight. Microsoft's IntelliEye system gets around this problem by putting a Digital Signal Processor chip good for some 18 million instructions per second, and a little digital camera, in the mouse. 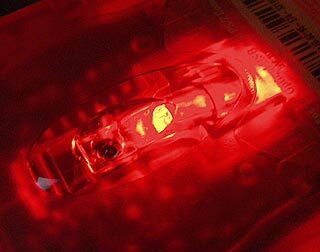 An alarmingly bright red LED (which dims after a moment of no activity, to avoid dazzling people if you lift the mouse off the desk), obliquely illuminates the surface of whatever the mouse is on, to accentuate the surface detail. The camera takes 1500 snapshots of the brightly lit surface each second, and compares them to see which way the mouse seems to be moving. As long as there's some detail for it to look at - it's not on a slab of translucent plastic, or a glass table, or a mirror - it tracks accurately and smoothly. And there's nothing to get dirty but the little slidey-pads on the mouse feet. You can move an IntelliEye mouse quite quickly without it losing track of its location - some really enthusiastic gamers manage to move IntelliEye mouses too quickly for them to be able to track their location properly. But most users, including me, have no problems. Until recently, there were only two IntelliEye mouses. I reviewed them here, but here's the executive summary. The plain IntelliMouse with IntelliEye has the same slightly bulbous shape as previous Microsoft "ergo" mouses, and the same two buttons and clickable wheel doohickey. It's a plain smooth cream-coloured thing, with only the faint glow from the IntelliEye sensor underneath to distinguish it from the regular opto-mechanical version. It costs $AU79. The $AU90 IntelliMouse Explorer is the big fat show-off model. It's got decidedly asymmetrical styling, two extra thumb buttons on the left hand side, a see-through red baseplate, and a decorative red tail-light that's close to useless - it indicates when the mouse, in USB mode, has got a successful USB connection, but you can figure that out pretty easily anyway by just trying to move the cursor. The $AU85 IntelliMouse Optical is the new one. It looks like a hybrid of the other two IntelliEye models. There are two extra buttons, like the Explorer's, but they're mounted one on each side. The Optical's styling echoes that of the Explorer, but it's symmetrical, and the body of the mouse is cream-coloured, not silver. The side buttons and nose inlay are silver, though, and it's got the same red baseplate and tail-light. It's quite a good look, I think. With all of these mouses in the $AU80 to $AU90 range, there's really nothing between them on price. And you can, indeed, get a mouse for a lot less than that. 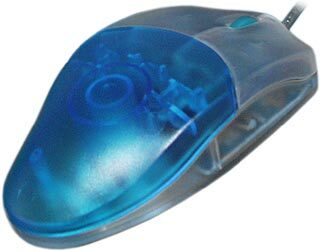 Basic two-button opto-mechanical mouses can be had for $AU10; for that price, you could buy a new one every time one gets dirty. If you want a quality, brand-name mouse with a wheel doohickey, you can get Logitech's slim-and-comfy First Mouse Plus for $AU39. 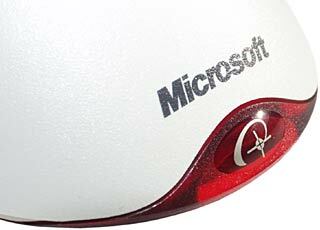 As computer gizmoes go, though, the IntelliEye mouses still aren't very expensive. If you're not trying to penny-pinch as you outfit a whole office, $AU50 either way is a drop in the ocean by PC component price standards. The ball-less, maintenance-free design also makes the IntelliEye mouses a good choice for things like Internet cafes, as long as the customers don't steal them. At least the customers can't steal the mouse balls. Which happens, by the way. People have to glue the ball retaining rings in place to stop it, and then they can't clean the mouse. Like the Explorer, the Optical has two curvy side buttons. Unlike the Explorer, there's one button on each side. You can set the buttons with the included IntelliPoint software to do various Windows-ish things, or just emulate a variety of keys. If you bind the buttons to, say, Page Up and Page Down, you can then easily use them in games that let you redefine keys; just bind whatever you like in the game to the keys that the mouse buttons are set to emulate, and you're in business. As far as IntelliPoint is concerned, actually, the IntelliMouse Optical might as well be an IntelliMouse Explorer. It worked fine when I plugged both mouses in at once; the left and right side buttons on the Optical just mirrored the functions of the large and small thumb buttons on the Explorer. The Optical, like the other IntelliEye mouses, is also a dual-interface device - you can use it as a USB or a PS/2 mouse. The cable terminates in a USB plug, but you get a little green adaptor as well, that lets you use the older mouse interface if you like. 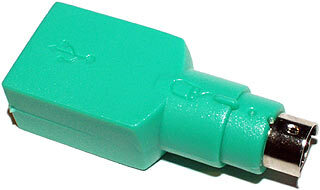 Note that this adaptor is not a magic converter that can turn any USB mouse into a PS/2 one; the interfaces are quite different, and the mouse has the ability to output both kinds of signal. The adaptor just gives you the right kind of plug, and tells the mouse to switch to the other operating mode. Even if you've got USB ports, you may want to use PS/2 mode, because it'll work when you're not running a USB-aware operating system. For instance, when Windows 98 starts up in Safe Mode, and for most of its setup procedure, it's unable to see USB devices. Anything you can do in Windows with a mouse you can also do with the keyboard, but if you get sick of all that tabbing and alt-tabbing, it's nice to be able to make your mouse work again. Every new mouse feels weird for the first few hours, and so does the Intellimouse Optical. After using the bigger Explorer, the tapered waist of the Optical makes it feel a lot narrower; it'd certainly be better suited to people with small hands. Whichever side button falls under your thumb is easy to use, but the other one has to be pressed with the ring finger, and isn't very convenient. The scroll wheel on the Optical is noticeably stiffer than the one on the Explorer. Scroll wheels don't normally "break in", so you're likely to be stuck with the stiffer action. I prefer the looser Explorer wheel, but the Optical one is hardly an aerobic workout to use. The Optical is less than a centimetre shorter than the Explorer, but that may be enough to help people with smaller mousemats. The Explorer is a bit too big for small mousemats, like 3M's Precise Mousing Surface and, according to some people, Everglide's notched-oval Attack Pads (reviewed here) as well. I don't have any problems using my Explorer on an Attack Pad, though. The Explorer really doesn't feel that big in use, though it is still palpably bigger than most mouses. It's not really all that wide, though, and even people with fairly small hands can use it. That doesn't mean that you're going to like it, though; plenty of people just don't like the Explorer, and want a slimmer mouse. Different mouses suit different people. One group of people that's certain not to like the Intellimouse Explorer is left-handers. The Explorer obviously designed only to be used with the right hand; the slant is all wrong, and the side buttons on the wrong side, for anyone else. For lefties, the Optical is probably the better of the two remaining IntelliEye rodents. The IntelliMouse Optical manages to look interesting, and cram in a couple of extra buttons, without being so peculiar as to alienate most users. Small-handed people shouldn't have a problem with it, left-handed people should be fine, too, and it's not very expensive, for what you get. The extra buttons aren't really a big feature, for most users, but it's not as if you have to pay a lot more money for them. The Optical isn't as obvious a big shiny techno-toy as the Explorer, but it works just as well, and its less look-at-me styling may put it on the acceptable side of the good-taste line for users who took one look at the Explorer and ran a mile. I'm going to stick with my Explorer, but if someone made me use the Optical, I wouldn't complain. It's a fine product. Readers from Australia or New Zealand can purchase all of the IntelliEye IntelliMouses from Aus PC Market. If your budget doesn't run to an IntelliEye mouse, but you'd rather not buy some anonymous two-button plastic block that just screams "I can't afford a nice mouse", consider these see-through specials from Skyhawk. Their mouses are perfectly unremarkable but quite comfy two-button jobs with a wheel and a thumb button (on the left hand side - at least lefties can USE this mouse! ), and they come in conventional beige, but also translucent blue, green, pink, orange and purple. And they cost $AU15 - about $US9, at current exchange rates. Which is, I think you'll agree, a bloomin' bargain. Skyhawk make $AU25 see-through PS/2 keyboards as well. Australian and New Zealand shoppers can get the latest cheap keyboards and mouses from my most excellent sponsors Aus PC Market. Click here to go there!